How to convert ASF file to MP3 format? Why do people need to convert ASF to MP3, even ASF file just works as well with local system playback? Well, for local system playback, ASF file would be of no obstacle. However, if you want to play ASF files on other players like your smartphones, tablets, or MP3 players, you’d better convert ASF to MP3. This guide would offer you 2 effective solutions to convert ASF to MP3 with 2 different ASF to MP3 converter tools. Let’s firstly get a brief acknowledgement about ASF file. ASF, short for Advanced Systems Format, is an extensible file format designed primarily for storing and playing synchronized digital media streams and transmitting them over networks. ASF is the container format for Windows Media Audio and Windows Media Video-based content. The extension wma or wmv is used to specify an ASF file that contains content encoded with the Windows Media Audio and/or Windows Media Video codecs. Being a part of the Windows Media framework and therefore playback under a Windows operating system is not very hard at all. You could use Windows Media Player to play back ASF files. Also, you could turn to 3rd-party media players such as VLC and Leawo Blu-ray Player. The latter one is a comprehensive media player that offers totally free service for you to play back media files like video, audio, Blu-ray, DVD and others for totally free. To convert ASF to MP3, you need a video converter tool that supports ASF file input and MP3 audio output. Leawo Video Convertertops all others with best quality and fastest conversion. As a professional video converter, it offers you the best solution to convert video and audio files between 180+ formats, including MP4 to MOV, MP4 to MP3, AVI to MP4, AAC to MP3, etc., and ASF to MP3 as well. You need to firstly download and install Leawo Video Converter on your computer. Then, launch it and do as the below steps show you to learn how to convert ASF to MP3. Click the “Convert” tab to enter the “Convert” module. Then, directly drag and drop ASF files into this ASF to MP3 converter. Multiple ASF files importing is allowed. You could even load ASF file folder. Click the drop-down box before the green “Convert” button. On the drop-down menu, choose “Change” option to enter Profile panel, where you could select MP3 Audio as output format under “Format > Common Audio”. 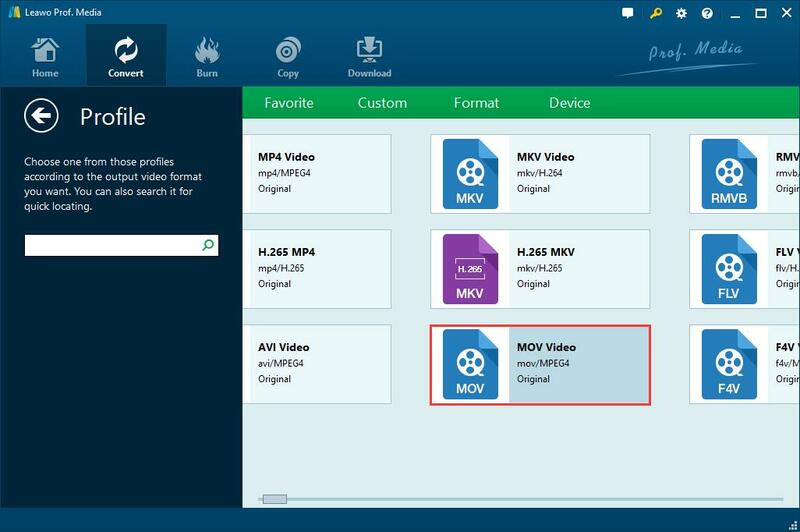 On the popup “Profile” panel, choose MOV Video under the “Format > Common Video” group as output format. You could also search MOV in the search bar on the left side for quick profile setting. Note: you could adjust the parameters of output MOV video profile like video codec, bit rate, aspect ratio, frame rate, audio codec, quality, channel, etc. To do these, on the drop-down menu, click the “Edit” button to enter the Profile Settings panel. 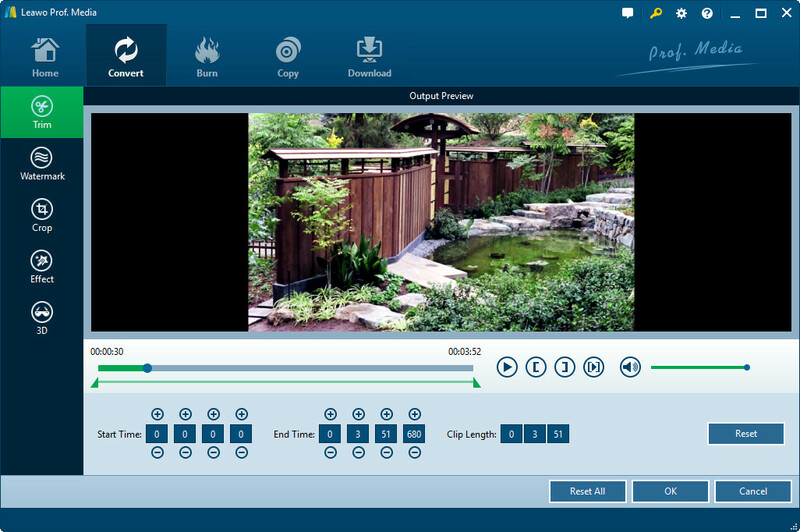 Right click the loaded DAT file and then choose “Edit” option to enter the editing panel, where you could trim video length, crop video size, add image or text watermark, adjust video effect, apply 3D effect, remove noise, etc. Click the big green “Convert” button on the top right corner. On the popup sidebar, set output directory in the “Save to” box. Finally, click the “Convert” button at the bottom of the sidebar. This video converter would start to convert DAT to MOV file immediately. It would take you some time to finish the DAT to MOV conversion. Many people wonder if there is free DAT to MOV converter that could convert DAT file to MOV for free. Actually, most desktop video converters provide no free service for video converting. But you could get a bundle of free video converters online. Here we would like to take onlinevideoconverter.com for example to show you how to convert DAT to MOV free. 1. Once you’ve entered this website, click the middle icon – “CONVERT A VIDEO OR AUDIO FILE”. 1. After you enter convert-video-online.com. 2. Then, you will be leaded to the video converter page. Click the “SELECT OR DROP FILE” button to browse and upload DAT file from your computer for converting. 3. 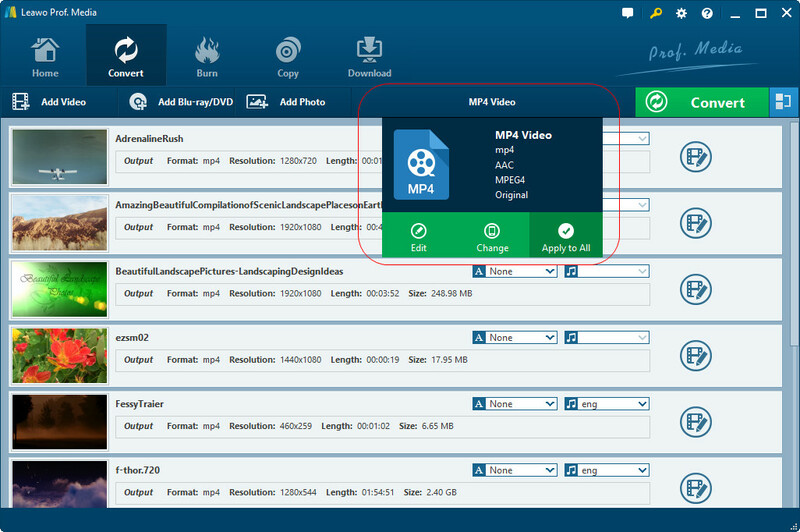 This free online DAT to MOV converter would then upload DAT file. You could see the uploading process. 4. Then, the page would guide you to select a format. Choose “.mov” from Video Formats group. 5. Then, click the orange “CONVERT” button to start converting DAT to MOV free online. 6. Then you will see the converting process. Once the conversion is finished, you will be provided a download link to download the converted DAT file. 7. Click the blue “Download” button to download MOV file to your computer. Once the downloading finishes, you could open the converted DAT file on your computer. Now it’s an MOV file already. Why do we recommend you Leawo Video Converter first even we have already gotten online free converters? Well, we would like to show you the reasons through the below table. Compare these two tools carefully and then you will know the reasons.